So many fish all over the place today. 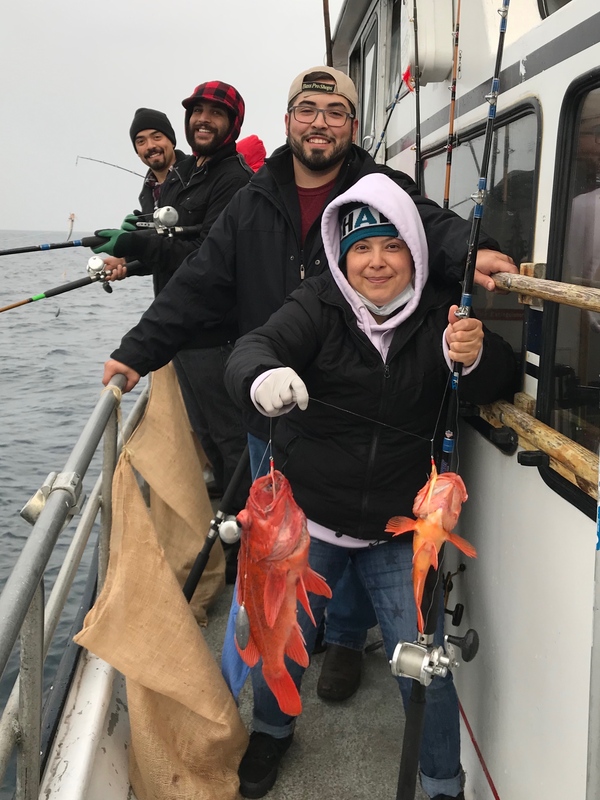 We had 24 passengers today and the fishing was so good that we got our full limits of rock fish in an hour! Plenty of nice yellow tails and nice blues today. There were small blues mixed in, but, we were able to trade out most of the little guys for our crew’s fish. The fish were chasing the anchovies and sardines all the way to the surface and we could watch the bait fiah boil all over the surface. Several times today someone would hook double blues 30-40 feet down. Catching fish today wasn’t a problem at all. On to the crabbing portion of the trip. The area that we have been crabbing has been totally over run by commercial crab gear. We managed to get 32 crabs today out of our pots, but there were just so many other sets of gear on us that we decided to pull our gear and move it to a place with less pressure. Hopefully the fishing stays the same and we can get dialed in on some better crab areas that aren’t being hit so hard.